IS it a castle? Is it a folly? Or a piece of redundant scenery from a movie set? 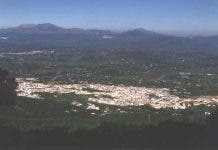 The origin of the brick tower standing tall on the hillside above Alhaurin el Grande, has been the subject of heated debate, splitting opinion across the Guadalhorce Valley and beyond. Many thought it was a Medieval castle, rumours did the rounds that the Moors built it and there were even whispers that it was a glorified tourist information centre. Some people even remember it from the opening credits to the ill-fated BBC soap opera, Eldorado. 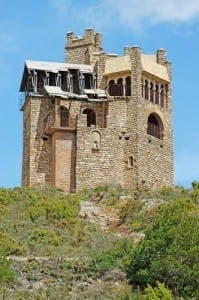 Now the Olive Press can settle the score once and for all by definitively revealing the true identity of the castle in the sky overlooking Alhaurin. 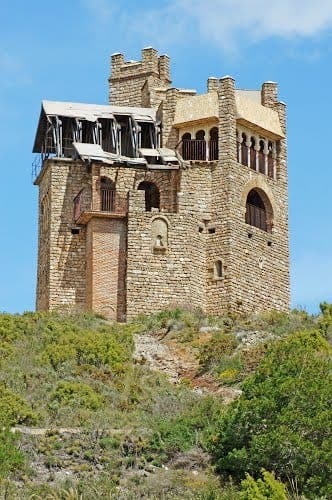 It was built as a water tower, cunningly disguised as an ancient castle to fit in with the region’s surroundings. Although it turns out it was a bit of a folly after all – constructed to provide irrigation water for a golf course that never happened. However, it is still something of an icon in these parts, visited by those who recall it from Eldorado and others who are hoodwinked into thinking they are visiting a historic monument. Used to see this folly most days when travelling inland on business from the coast, and heard it was a water tower, but is it still a water tower and does it serve any use? If not I thought it would make an interesting if not wacky villa, restaurant maybe even a small hotel with a great vantage point. @Mike, a good idea for it’s possible usage. We.just drove up there to find all the man hole covers are open, with huge holes underneath. The road is in a pretty derelict state, as is the building itself which seemed to be manned! Didn’t feel that we could intrude and wondered whether it was being squatted?